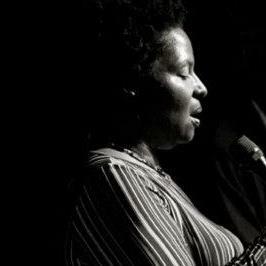 Vocalist/composer Fay Victor, called “artistically complete” by the New York Times, consistently hones a unique vision of the vocalist’s role in jazz and improvised music. Victor’s snake-like ability to fuse her prodigious vocal talents in myriad music arenas whether it’s song cycle written for Victor, original compositions, opera, Berio, jazz standards and the blues, all while maintaining her singular sound. She has developed a multi-genre approach called “Freesong”. Victor’s eight critically acclaimed recordings as a leader have received praise in venerable media outlets such as Downbeat, JazzTimes, The New York Times, The Village Voice, Time Out New York, The Wire, Signal to Noise, The San Francisco Chronicle, Time Out Chicago, The Chicago Reader, The New York City Jazz Record and JazzWise (UK). An established international reputation, Victor performs and teaches around the world with a veritable who’s-who of musicians such as William Parker, Roswell Rudd, Andrew Cyrille, Henry Threadgill, John Medeski, Nicole Mitchell, Marvin Sewell, Han Bennink, Myra Melford, Achim Kaufmann, Mark Dresser, Mike Reed, Darius Jones and Tyshawn Sorey amongst others.